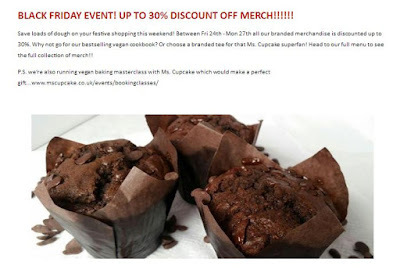 The Vegan Magpie: Ms Cupcake's 2nd Black Friday offer! Hello! Not only does Ms Cupcake have her in store muffin offer (see previous post for this yummy joy!) but they are also offering up to 30% off all their own brand merchandise and cook book! So now may be a great time to buy something if you've had your eye on it for a while! With 30% off, this makes the cookbook a nice comparable price to other online retailers, especially as this has free postage when ordered from Ms Cupcake! The merchandise does have postage costs though so do consider this before ordering.